Among the thousands buried at Lake View Cemetery are Jeptha Wade, one of the cemetery's founders and a leading contributor to the Cleveland Museum of Art; President James A. Garfield; Leonard Case, the founder of Case Institute that would become Case Western Reserve University, industrialist Amasa Stone and his family; philanthropist Samuel Mather and his family; Cleveland Clinic founder, Dr. George W. Crile; Severance Hall benefactor, John L. Severance; Sherwin-Williams founder, Henry Sherwin; Karamu House founders, Russell and Rowena Jelliffe; and Thompson Products president (later to become TRW) and avid auto collector, Frederick C. Crawford, founder of the Crawford Auto-Aviation Museum. Join me for a look at some of the cemetery's highlights. Before he left for New York, John D. Rockefeller was one of Cleveland's favorite sons. The "richest man in the world" at the turn of the 20th century began his business career in Cleveland and made his fortune by founding the Standard Oil Company, based in the city. Rockefeller donated much to the city's cultural institutions, including the land for Rockefeller Park. Visitors to the gravesite often place dimes at the base of the stone, perhaps hoping that their money will increase as Rockefeller's did. Eliot Ness, best known for his pursuit and eventual indictment of 1930s gangster, Al Capone, was Cleveland's Director of Public Safety from 1935 to 1942. He also ran (unsuccessfully) for Cleveland mayor in 1947. Although he lived in Pennsylvania when he died in 1957, he wanted to be buried at Lake View Cemetery. Actually, the stone is just a memorial to Ness. His ashes were sprinkled in one of the cemetery's ponds by the Cleveland Police Department, as part of Ness' final requests. Ness is just one of many government and civic leaders that "reside" at Lake View. Others include former Mayors Carl B. Stokes and Tom Johnson; Lincoln aide and Secretary of State, John Hay; and Senator Marc Hanna. Chisholm was, by all accounts, a kind and benevolent employer. His monument at Lake View Cemetery reads "erected by 6000 employees and friends in memory of Henry Chisholm, Christian, philanthropist, and everyone's friend." After Chisholm's death, his mills were the site of many violent clashes between workers and management. 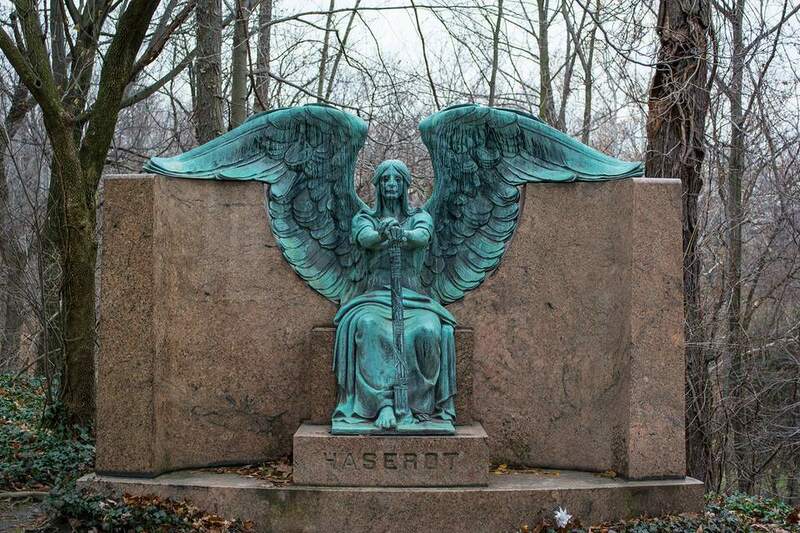 Lake View is noted for its many stone figures of angels that adorn the cemetery's monuments. These range from Victorian cherubs to modern depictions. Lake View sponsors periodic guided tours of the angel monuments. James A. Garfield, the 20th President of the United States, was an Ohio native. Born in what is now Moreland Hills, he attended what became Hiram College and lived in Mentor before moving to Washington and the House of Representatives and ultimately the White House. He was assassinated and died just six months after taking office. The Garfield Monument at Lake View Cemetery is a 180-foot tall, cylindrical building, designed by architect George Keller. It was dedicated in 1890, two years after the president's death. It sits on a hill, overlooking the cemetery grounds. The outside is adorned with five bas-relief panels, depicting scenes from Garfield's life. The main floor of the interior is decorated with elaborate mosaic tiles, marble columns, and colorful leaded glass windows. The focal point on the main level is a larger-than-life statue of President Garfield (pictured above). The lower level contains the flag-draped coffin of President Garfield and that of his wife, Lucretia. Two urns containing the remains of the Garfields' daughter Molly and her husband are adjacent to the coffins. The Garfield Monument is open daily between 9 am and 4 pm from April 1 to November 19. Interpretive guides are available for brief tours and to answer questions. Admission is free. Charles Frances Brush (1849-1929) was a Cleveland inventor whose original arc street light still stands at Public Square. His Brush Electric Company ultimately became General Electric. The Brush monument at Lake View Cemetery was created by Joseph Carabelli, who also created the John D. Rockefeller obelisk and the Wade Chapel. Other Cleveland inventors buried at Lake View include Garrett A. Morgan, who created the gas mask and the first traffic light. The Community Mausoleum at Lake View Cemetery is located near the Mayfield Gate. Opened in 1990, this modern structure has granite walls and a glass and steel roof, dotted with frequent skylights. It houses private and family burial rooms and a large non-denominational chapel. The opening of the mausoleum reflects the growing trend towards cremation and away from traditional outdoor plots. Scofield (1842-1917) is best remembered for designed the Soldiers' and Sailors' Monument at Public Square in downtown Cleveland. The Schofield Vault is just one of many ornate stone vaults and mausoleums at Lake View Cemetery. Jeptha Wade Jr. had the Wade Chapel constructed in 1901 in memory of his famous grandfather. The Greek revival structure, designed by the architectural firm of Hubbell and Benes. The interior of the chapel was designed by Louis Comfort Tiffany and is one of the few Tiffany interiors still intact. Among the adornments is a Tiffany window (see inset in the picture above), entitled "The Journey of Life." The Wade Chapel is open to the public daily from April 1 to November 19 from 9 a.m. to 4 p.m. The chapel is staffed with a guide and admission is free. There is off-set parking near the chapel.